Work your fanny off, Learn a ton! DAY 1 we will be on location in the USA's 2nd largest canyon, Palo Duro Canyon. 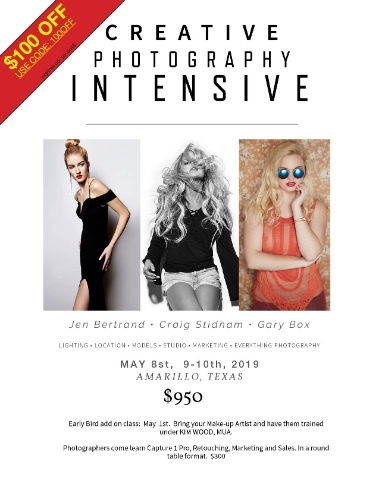 We will be learning all about different fashion inspired senior posing and learning to control the light in the west Texas sun with strobes, scrims and reflectors. DAY 2: We will be in a studio environment working with studio sets and making the most of them. You will learn studio lighting, how to shape light with different modifiers and how those modifiers help to create certain types of light. Sponsored by SAVAGE BACKGROUNDS. In the evening of one of the days we will have a group digital Image Critique. During which you will learn design elements, photography composition, and other items to improve your creative images, which will result in better sales to your clients. in by a Local Professional Chef. MAY 8th Early Bird Class Day - ADDITIONAL COST SEE Early Bird Registration for Details on cost. KIM is a Master Makeup Artist. She will be teaching fellow MUA's the world of Photography and FILM, and making your life better as a photographer by having the correct makeup application. FOR PHOTOGRAPHERS: Spend a Day learning Marketing, Sales and Business from Gary Box, a photographer who knows a thing or two. Also gain retouching tips and tricks by Craig Stidham. You may TRANSFER your seat by contacting Craig with the name and the contact information of the new attendee. Seats may not be sold for more then the cost of the purchased seat.